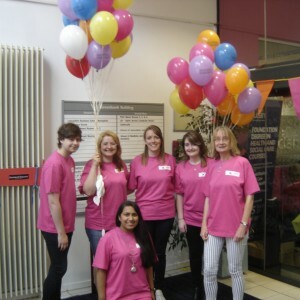 The first visitors to arrive were treated to a performance of ‘Cake’, which offered something in between object theatre and puppetry as a way of engaging with storytelling without words. This unique performance, by the Whalley Range All Stars Theatre company, told the story of a struggling community of tiny people who lived inside a giant cake. Their lives were plagued by the villain of the show, an enormous mouth! Audiences were surprised and animated by everyday objects which were turned into villains and heroes of a very strange kind indeed. See our You Tube clip below to sample a taste of a most unusual ‘Cake’! In the Greenbank Foyer, visitors were able to try out a number of alternative storytellings, beginning with Paul Coulton’s amazing Phygital designs, which aim to offer a much more interactive form of storytelling through innovative object designs. Children and adults alike were enthralled by the ‘scarebot’ which blew flavoured bubbles and told stories through a variety of interactive devices. 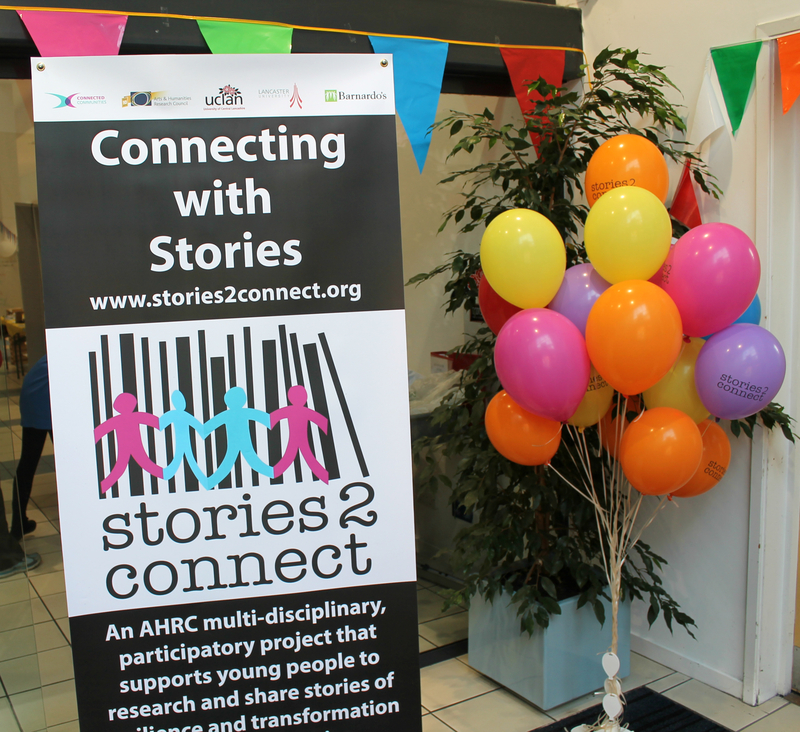 As visitors engaged with the Scarebot, project members were able to gain a sense of the exciting possibilities for re-working stories collected through ‘Stories2Connect’ in the months ahead. Across the way, Annie Anderson, our artist in residence for the day, engaged with eager children and young people who wanted to express their stories through other creative forms. Here, visitors were able to create their own stories to take home with the talented Annie on hand to encourage visitors to develop new skills and try something new. A beautiful array of artwork was produced which we hope will also inform and enliven the stories that become part of the project’s connections with communities far and wide. After getting arty with Annie, other visitors hopped across the foyer to visit Emily Capstick, a scriptwriter, storymaker, children’s author and script writer, who created a wonderful ‘shoeseum’ storytelling especially for the day. Children, young and old, were delighted by Emily’s magical stories of the shoes that had been left behind. Audiences explored the past, present and future as they were invited to imagine how shoes became lost and what happened to them afterwards in a very engaging and playful way. Emily’s skilful adaptation of these ideas fuelled imaginations and inspired the audience to continue with their own version of events whilst they created alternative shoe story plots later in the day. Then it was off up another flight of stairs for yet another interpretation of stories through drama and dance. First stop was a spot of drama-therapy with the lovely Jonathan Hirst. Here, workshop participants celebrated alternative forms of self expression and communication with others by using story as a form of positive communication. First of all, participants created a six-part cartoon strip and then had the opportunity to bring this to life as an energetic group re-telling through drama. Next door, dance lecturer and artist, Ruth Spencer, offered a preview into how our bodies tell stories through gesture and movement in her lively dance workshops, which appealed to visitors of all ages. Ruth prompted participants to notice how the body tells its own stories through a wide variety of expressions that reflect people’s feelings and emotions. She then used these reflections as a basis for visitors to create their own adaptation of story through dance and movement. These workshops were a real hit with whole families as they had fun reading stories through the body in inventive and enjoyable ways. 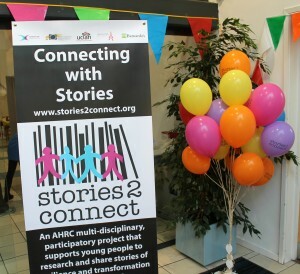 Please watch our full playlist on Youtube by clicking the link at the top of our webpage or alternatively subscribe to our channel ‘stories2connect’ to keep up to date with our storytelling activities throughout the project.